Successful and influential electronic rock and pop band, formed in Manchester in 1980 (after Joy Division), characterized by epic 12" singles dressed in arty sleeves and released on Factory Records. Key members include Bernard Sumner, Peter Hook, Steven Morris, Gillian Gilbert and Phil Cunningham. Key releases include "Blue Monday", "Regret", "True Faith", "Crystal", "Everything's Gone Green", "Ceremony", "Confusion" and many more. "Blue Monday", issued in 1983 (and many times after), is the best-selling 12" single of all time (as of 2011). The band split in 2007, but announced a reformation in 2011 minus Peter Hook. New Order signed to Mute Records in 2014 and released the album Music Complete the following year. 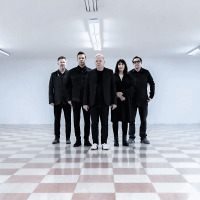 Sun 7th Jul 2019 New OrderTrinity College Park (Dublin)More Info..
Thu 18th Jul 2019 New OrderHarbourside (Bristol)More Info..